This is a feeler/interest thread. If enough interest exists, I will move forward with organizing this Group-Buy. This Group-Buy is for Cat-Cam's 280/272 camshafts and 288/280 camshafts with the option to add followers. *If interest in other durations exist, I can add these to the Group-Buy as well, however the above 2 options are the most popular and most documented. It is recommended to replace the followers when installing cams. 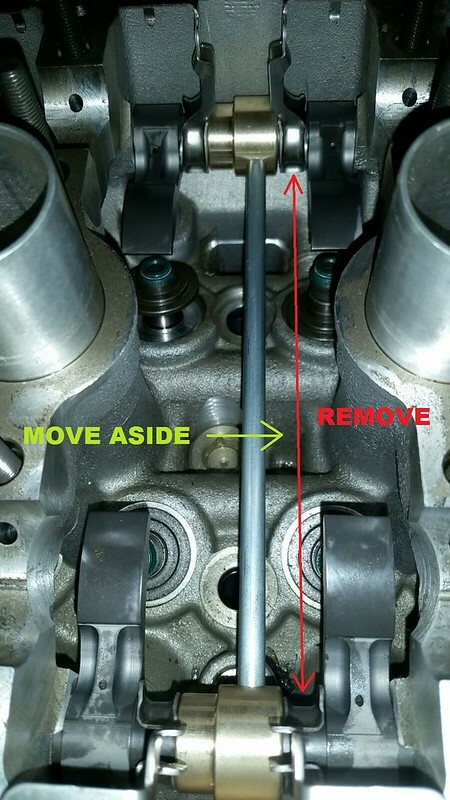 Both the camshaft and followers wear together and by not swapping followers, you do risk the possibility of accelerated wear on the new camshafts. That being said, followers are an "optional" inclusion to this Group-Buy. There are plenty of forum members that have chosen to reuse their stock followers when installing 280/272 cams and have had no negative consequences. If you decide to reuse the stock followers, you do so at your own risk. If there is visible wear on the stock followers/stock cams or high-mileage on the motor, it is advised to replace them with new followers. Cat-Cam's DLC Coated cam followers with oil feed from the rocker arm to the cam lobe. "This kit includes an "oil bridge" to bring oil from the exhaust to the intake rocker arm shaft (which has no oil pressure), from where it is fed to the rocker arms. The rocker arm shafts need to be drilled, which can either be organized by the customer, or we [Cat-Cams] can supply new modified rocker arm shafts (sourced from BMW). The oil bridge can be moved left/right in order to torque the head studs and set the valve clearance just by removing the rocker arm brackets." 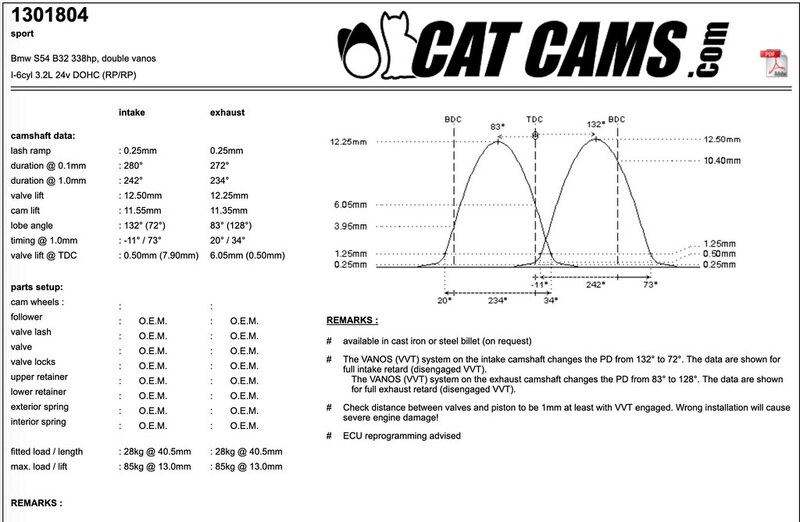 -Cat-Cams (280/272 or 288/280): $850 + shipping from SC to your doorsteps. *Usual retail is around $1,145.95 + shipping. Saving you $295.95 (26% off). -Cat Cam's x24 Coated Cam Followers + oil bridge (NO ROCKER ARM SHAFT): $1,350 + shipping. *Usual Retail $1600 + shipping. Saving you $250 (16% off) -- Approx. $56.25 per rocker arm + includes Cat-Cam's oil bridge. NOTE: When installing these cams, you will need to transfer the pressure regulating valve over from your stock cams to the new Cat-Cams. Cat-Cams is unable to drop-ship these individually to participants. Instead, a bulk package of all the Cat-Cam camshafts will be sent to me directly and I will need to resend these packages out to each of you individually. I will need your zip-code in order to get an accurate individual shipping quote for each person participating and you will be responsible for this cost as per the Group-Buy. If you live local to me (SC/NC/Ga area) you can also avoid the reshipping cost by local pickup once the package arrives. If you would like to get a shipping estimate on your own, my sending zipcode is 29205 and the box details are: "730x210x110mm - 8.5kg for 1 box containing 1 camshaft set." As per Cat-Cams "They are shipped inside another box for extra protection." "Lead times depend strongly on availability of semi finished camshafts, but when these are available it will be close to 3 weeks." For this Group-Buy to move forward, at a minimum I'd like to hit 21+ participants for cams (this can be in any combination of 280/272 or 288/280 cams) and 11+ for Followers. *Once I have your Zip-code, I will begin to get domestic shipping quotes. Last I checked from, SC to Cali (likely the furthest transit) was around $48-50 bucks. *Payment instructions will be sent out if we can hit the Group-Buy goal. Additionally, I'd like to also offer the OE CSL Camshafts for those that want to keep things factory BMW and for cool factor, as well as OE CSL Exhaust Valves, and OE BMW (Non-Coated) Followers. For those with CSL airboxes, the CSL Cams should keep things simpler as you could run the base CSL tune file without worrying about adjusting for cam values. 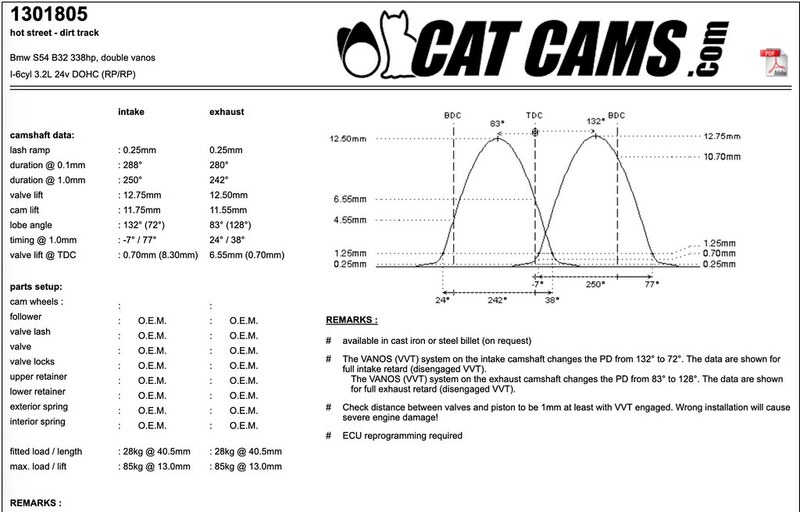 Please note that these cams do not count toward the 21+ orders needed for the Cat-Cams Group-Buy. There is no minimum order for these OE BMW CSL parts. Away on vacation from April 23-25, 2019. All PMs will be replied upon return! Mod list: TTFS Custom Tune, Headers Sec 1 AR20, M-Track Mode programmed , IAT relocated, Upadted cam bolts with S62 pressure springs and diaphragm, sub-frame reinforced Vince bar & plates, 996 Brembo brakes PFC 08 pads, CDV delete, F10 M5 shift knob, CSL diffuser, D/A pulleys, AVANT-II, Dinan CAI, SDW RTAB, Ohlins Custom GC Weight Jacks, GC Street Camber Plates, Hotchkiss sway CSL rear bar, Beisan Oil Pump Disk, ECS camber arms, N15 SPAL 2082 fan, Micro-blue rod bearings, ZHP .712 Yellow tag rack. Last edited by Good; Wed, Mar-27-2019 at 05:31:26 PM. I particularly need zip-codes to get individual shipping quotes for once these bulk land in the USA. If you are close and willing to drive to SC, local pick up is fine too. Last edited by Radekxpl; Thu, Mar-21-2019 at 10:36:45 PM. How are these vs Schrick? Great. Plenty of guys are running Cat Cams on here with zero issues. Schrick are great too, but over twice the cost. I looked at offering Schricks but the pricing just couldn't be justified...and they are planned to go up in pricing too from what I was told. Interested. Do you have more info on the process to drill the rocker arm shafts? Are any special tools or jigs required? I will have to ask them more about this and what all is involved. Perhaps they can include instructions if they don't already. Will report back. All times are GMT. The time now is 08:02:36 PM.